The Pyramid has nothing to do with Egypt. What it does is reveal something important, hidden in the mind of man, past and present. The art historian, Sir Kenneth Clarke, in his magnum opus "Civilization", said: "All art is in one way or another about the search for God," which means the Pyramid triptych revelation must have been calculated by a timeless, holy force of mind. The Pyramid emerged from years of study into a different way of looking. This alternative vision instructed I combine an ancient binary coded data set with a modern arrangement from the world's oldest constantly used book, using this simple, mathematical system. Messianic meaning is revealed throughout the resulting scheme, most obvious in the central imagery of the Pyramid, where the first and last letters of the alphabet are overflown by a butterfly. As I mention above, no human mind could have intended this content and, if the scientific world view is correct, it shouldn't exist at all. The revelation of messianic meaning then, offers proof mathematical of the divine force in man and how we can lay claim to His purposes through synergy in real-time. Just as the bright words here link to pictures and deeper definition, great art reveals beauty from beyond, discerned by the artist. Pyramid Art's potential to reveal this beauty to you personally comes from a systems approach, following directions provided by the Jungian observational phenomenon known as synchronicity. The perception is rare, but it need not be so. Its guiding inspiration can be obtained on demand now when you join Papolona.guru. This language then, represents a window on the human capacity for synergy with space-time through feedback with the hidden dimension you may think of as timelessness and becomes possible using the technology you'll only find here, to develop new awareness. Synchronicity overtook me one night at the age of twenty seven, with hundreds of events thereafter on some days. That's how I know its guiding potential gives access to a level of mind materialist thinking will never grasp. Such a "normal" lack of discernment is exemplified by what neuroscience refers to as "The Hard Problem," a phrase characterising its failure to explain how the mind works. Equally, the synergistically receptive mind is something we can tune-in with practice, like any other skill, if we would only drop some cherished assumptions about free will. "The intuitive mind is a sacred gift and the rational mind a faithful servant, but we've created a society honouring the servant that forgets the gift.” The ongoing amnesia stems from our failure to develop working synergy with the source of our own creativity. That means it is within the remit of art. My tuning-in process took me on an artistic journey from London to São Paulo Brazil and on to Canada, where I married into the Trivial Pursuit clan. There it became clear something pernicious was in progress, so I returned to Brazil, then came back to Europe and ended up living in France. The gold header button tells how the Pyramid was discovered on the way. The basics are simple: Guidance appeared when I asked questions in my head, answered symbolically on the fly by meaningful coincidences in my environment. This equates to the abiding religious experience referred to in the Bible: "Ask and ye shall receive". But I was brought up as an atheist. The effect was to develop my synergy partnership with timelessness, clear of any one religious tradition. I argue spiritual vision as a cognitive synthesis, is the ultimate development of fine art because the Pyramid offers proof of principle for human synergy with nature, simply by refocusing our observational skills. In a nutshell the Pyramid reveals how beauty, rather than merely in the eye of the beholder, is a cosmic force, an ancestral intelligence reflected in everything. It operates from our unconscious mind, sparking all ideas, desires and perceptions that pull at our strings with enchantment and weirdness in dreams, déjà vu and synchronicity. This means that to eliminate iniquity from life's equation is impossible, unless it's by amplifying the influence of the unconscious, through positive feedback, towards a synergy partnership. So, lets take a look. The first thing to understand is it's a systems piece in three parts, like a medieval church triptych. And, it answers that big question Carl Jung posed mankind after the horror of WWII: Are we related to an infinite being or not? Graphically it confirms how cosmic beauty possesses psychoactive force from the subconscious in a way we can all learn to steer in our lives, by applying the butterfly effect or in this case, the Papolona effect. This language would be the catalyst to initiate a real-time relationship with the sublime, capable of keeping the sorcerer's apprentice, ego mentality in check by building a divine kind of synergy into our creative thinking. It emerged from my pioneering observation technique that informs through the effect we all get on occasion and Carl Jung named synchronicity. Pyramid Art verifies my claim to having achieved synergy with space-time through it, because it reveals the persona of the Great Spirit of nature through its hieroglyphic style imagery. In technical terms such meaning can only belong to a holistic mind the individual's unconscious is already part of. To begin with, the central imagery of the Pyramid consists of the A and Z monogram, overflown by a butterfly. That's remarkably descriptive and messianic, given these images are as likely as a room full of monkeys dancing on typewriters is to produce the complete works of Shakespeare. You see, they're built as a systematic combination of two binary coded data sets, using a mandala structure to produce an interference pattern. One of the code sequences is relatively modern, the other is decidedly ancient. You can be sure then, the meaning exposed belongs to a timeless entity, hidden within the fabric of existence, which I observed and took instruction from. The process of tuning took some years and ultimately led to my creation of the Jewel Mandala, a structure that acts like graph paper where the symbols are plotted, using a mathematical system so simple, a child can understand. The meaning of the Pyramid reflects the channelling quality of my observational process, where I teamed up with timelessness. The mission is to expose the universal foundation of beauty. Humanity needs to relate to this abstract ancestor to avert the global disaster on the horizon. Reason has gotten us into the mess we are in, because we're blind to the unconscious roots of our ideas. Science does not acknowledge the timeless dimension is the source of human intelligence. Sensitisation is needed to open the perception, and it would seem only a work of art can do that. We all experience synchronicity occasionally, along with other anomalies of awareness. My discovery of the Pyramid proves these effects steer us to synergy with space-time, if we use them as signposts. The very existence of the Pyramid begs two questions: Why do the psychological effects I mentioned surface in everyone from time to time? and... How can you know if the guidance I claim to have pursued is real or not, where you might encounter the same? You need to be aware why this art has such monumental significance, so bare with me now while I jump to a seemingly unconnected area of science. Here's the thing: Free will is not what the conscious ego thinks it is. Consider the mind effects of parapraxis and déjà vu and you'll understand. On top of that, while evidence to the contrary stares us in the face, the whole rational system supporting the concept of free will is blinkered and we refuse to acknowledge this, simply because conventional thinking sees nothing wrong. But in failing to notice a transcendental light through its thicket, we've shut off our ability for developing conscious synergy with nature, which is the only thing that can save us from ourselves. Modern science has its knickers in such a twist on this issue; it must close your mind by proposing a fantasy concept i.e. the multiverse. This preposterous doctrine first appeared back in 1954, in the graduate thesis of a fellow named Hugh Everett. It was then summarily bolted on to the scientific cannon to explain away the Anthropic Principle; the observed fact our universe is finely tuned to produce life and reasoning intelligence, such as ours. At the time, the ethically truthful, but vehemently godless foundation of scientific thinking, having remained untested, had been safe from attack since the age of reason by virtue of its evidence based knowledge gathering system. So far so good from a humanistic standpoint, but in the mid-nineteen-fifties the status quo was challenged by Fred Hoyle, the theoretical astrophysicist who discovered the fusion process, creating carbon within stars, is so finely tuned and so unlikely, it could not be the product of mere chance organisation, so carbon based life, such as ours and indeed, the entire universe, must have been designed by a cosmic intellect, i.e. God. The multiverse concept was a way for cosmological science to "Trump" that idea. However, its adoption was simply a perverse gamble motivated by entrenched atheism and not by any proven fact, since evidence to support the theory is impossible to acquire. Worse still, it has put the future of life here at risk. We have disturbed the balance of the planet so comprehensively because the tactic worked, Hoyle was ignored and the hegemony of scientific godlessness was maintained. It's a big deal because our world vision continues to be corrupted by this institutionalised deceit. The multiverse concept apparently defines the useful limits of rationality. Essentially it imagines ours is just one of an infinite number of universes, whose laws are determined by chance. Remember, this is a doctrine preferred by the arbiters of scientific truth, so they can maintain, despite evidence to the contrary, our universe obeys laws set at random and not by a supreme being. This way the need to investigate him can "legitimately" be sidestepped. Logic dictates if ours is a randomly arranged universe, only meaningless shapes would result from my pattern making system. Remember, I followed chance synchronicity events as signposts to create the Pyramid. According to conventional wisdom then, no revelation concerning a creative force at the heart of reality would be likely to emerge from my process, yet that's precisely what happened. It's obvious in the central imagery of the pyramid and occurs throughout this language, the more you look. You'll notice, all the corners: an anchor, a fisherman and the letter "b" for "being" are symbols for Christ and the whole sequence tells of a mythic development towards synergy as a story you can follow. So, what can be going on? The fact my creative process centred on synchronicity as the expression of my feedback with space-time is key. Conscious feedback of this kind implies an unconscious intelligence underlying reality exists to feedback with, in order to find the working synergy I claim. What if chance only appears to be random because conventional wisdom is blind to its pattern? What if that pattern is the only thing that can save us from ourselves by activating the quality of the mind hidden to logical rationality, but nevertheless accessible to the intuitive mind, a path to synergy with nature at the timeless level? The Pyramid would be the iconic statement, by the universal abstract, to be studied at length, but where can we focus our attention to find guidance in our day to day? Physics says the whole universe is a quantum phenomenon. Experiments have confirmed, the quantum field, the connected void within atoms, which includes the void between the stars and galaxies of the entire universe, presents a non-local force involved in quantum entanglement, a curious phenomenon that defies relativity. We also know that force is psychoactive because the results of experiments at this scale hinge on the intentions of the scientists who carry them out. It implies this non-local force never needs to travel anywhere because it acts everywhere simultaneously and it influences us unconsciously. Essentially it's a timeless dimension we are unaware of in real life... but come to think of it, sometimes it does break through to consciousness. It would naturally be responsible for all the mind's creative functions. My Pyramid and the meaning it reveals, relied on tuning-in to timelessness. It's the proof we are capable of waking up to His ubiquitous dimension and lifting humanity out of the crisis we're in through individuals en-mass developing their natural genius. The very existence of meaning expressed through Pyramid art, given its systematic and mathematical structure, suggests there must be a cosmic plan we can tune-in to because it has to do with an unconscious force controlling the way the intuitive mind works. 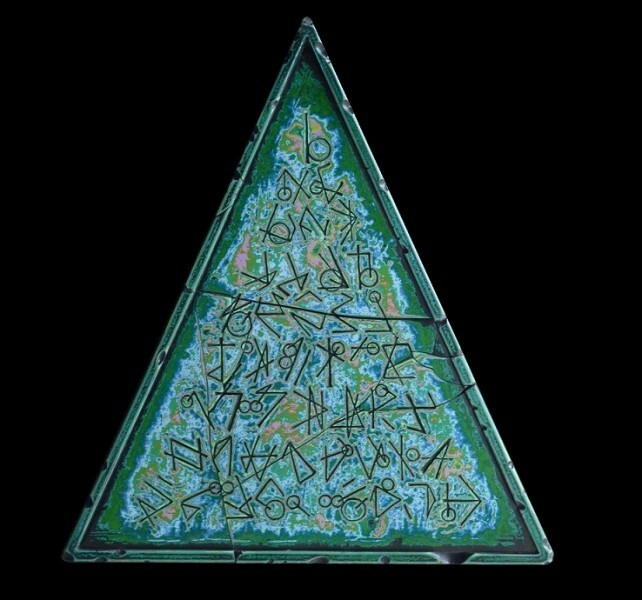 In that context the AZ symbol in the central imagery of the Pyramid suggests the source, its goal and something like a treasure map to navigate the labyrinth of existence. It's also an update to the Biblical Alpha & Omega, beginning and end of the ancient Greek alphabet. That was the symbolism early Christianity used to represent the liberator, or messiah. Above the monogram is a butterfly in flight, referring to metamorphosis, liberation, the butterfly effect and timeless beauty as a living beast; which by the way, is drawn like a signature, in one continuous line, changing direction just four times. That alone is a graphic indicator of intelligence beyond, but when the Pyramid is revolved through 90 degrees the direction of the butterfly changes 180 degrees. This I interpret as a message from the abstract, saying something like: Join Me consciously and I will manipulate your perception to double your effective creative power. The quantum void makes up more than 99% of the volume of physical matter here on Earth, including our brain matter, from where its force must continually influence our thoughts, whether we realise it or not. The rational ego, through a lack of understanding, suppresses the perception, whereas responding to his clues as feedback amplifies his genius force of mind. Planet Earth is in a perilous situation and we need help from somewhere now because "expert" thinking is not immune to the complacent corruption infecting all established elites; the people and systems that have gotten us into our current mess. Synchronicity had become the dominant feature of my awareness by the age of thirty, so I was positioned to use it as an observation technique to direct my artistic enquiry into timelessness when I moved from London to São Paulo Brazil. This move eventually came to fruition through a creative episode, bracketed by global synchronicity in 1987: The Great October storm and Black Monday. That episode revealed the Pyramid as an interference pattern between two binary hexagram codes found in a western, twentieth century translation of an oriental philosophy. Would deliberate action in synergy with timelessness, bestow merit on its actors for eternity? It stands to reason it would, and the opposite must also be true. The fact we are normally unaware of the ancestor cannot therefore, be a good thing. For starters he comes across as spooky when we do catch a glimpse, so we recoil in horror and confusion, then promptly forget those "incidents" while the ego reasserts itself as sole possessor of self. The alternative would be to do as I did: Love, listen, follow and develop synergy over time, so a marvel might emerge. While I know deep satisfaction will come from your synergy with the ancestor, once you develop it, all I can do is implant these ideas and offer initiation and development tools, once you sign up. You may already have experienced the stirrings of the mystery I'm talking about, as an apocalyptic form of beauty. This shines through the Pyramid for your contemplation as a catalyst for conscious partnership. To reform mankind's abusive relationship to nature and each other, requires we transform our thinking by comprehensively tuning our intuition in to timelessness as both an inspirational and self limiting force. I offer my project for that purpose. You're invited to become a co-artist, though no artistic skill is needed. A willingness to accept the intuitive mind and adapt to its prompting is essential though. While you're in this mode, you can also learn the language of The Pyramid. Sign up here Papolona.guru or the butterfly button in this page header, then compose some honest guidance question(s) to start your ball rolling. Click the button and you'll receive clues via the quantum field, the only place science has detected timelessness in action. Allow these things to inform and guide your inner vision. The process will tune you-in to space-time.